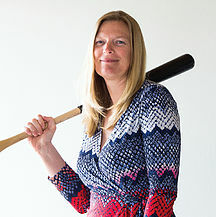 People scoffed at Justine Siegal when she said she wanted a career in baseball. It turns out that Siegal has had the last laugh. Beginning in 2008 at Springfield College, in Massachusetts, Siegal, who grew up going to Cleveland Indians games with her grandfather, worked as an assistant coach for the men’s baseball team. In 2009, she became a coach with the Brockton (Mass.) Rox, a men’s independent summer-league club. 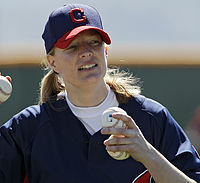 In 2011, she pitched batting practice for the Indians, something she would do for five more major-league teams. 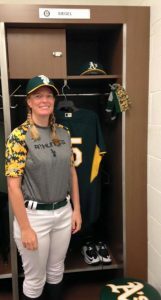 In autumn 2015, she coached for the Oakland Athletics’ club in the Arizona Instructional League. She’s considered to be the first female to work in each of the four roles. Siegal shared her incredible story in this special Q/A. Did you set out to make a career in baseball? Siegal: I wanted to become a college baseball coach since I was 16 years old, so I started coaching at camps, reading books, watching videos – doing everything I could to learn. I also decided when I was 16 to get my Ph.D. to help me become a better coach. I knew that I didn’t have the same opportunities as men within baseball, so my plan was to out-educate most of them. I figured I’d do something in sports psychology to help me become a better coach, to help me get a coaching job, since no woman had ever coached [men’s baseball] at the college level before. How did you know that route would improve your chances – had you talked to coaches, career counselors, people in Major League Baseball? I just took a guess. The person I told my dream to laughed at me: my coach from the camp I was at. He said that a man would never listen to a woman on the baseball field. That’s when I decided I needed a plan, something else, and that would be a Ph.D. I felt sick to my stomach, but I didn’t say anything. I decided, still, that I was going to ignore him. There’s no logical reason why I’ve accomplished what I’ve accomplished, but here I am. I’m very honored to be a part of some of the history I’ve made. But having paid your dues on the field and in the classroom, why shouldn’t you be where you are? Because the first person laughed at me, I didn’t really have too many people encouraging me, I had more people telling me to quit than to stay and it took years. With the A’s, I had asked them [to coach] for four consecutive years: 2012, ’13, ’14 and ’15. You just keep going. It’s not really a career plan and it doesn’t make sense to keep going, but I did it anyway. You must have a deep reservoir of persistence, determination, stamina and initiative. I’m really stubborn. 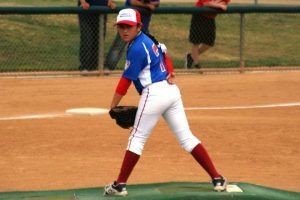 I was 13 when my coach told me to quit baseball because I was a girl. I knew then that that was wrong. Even at 13, even without a whole lot of knowledge, you have this idea of what is right and what is wrong, and that just felt wrong. So, I just kept going. At 13, where was that team and what kind of team? It was a local youth league in Cleveland. Usually, I was a pitcher, catcher, short, third – where you needed an arm. I still played on that man’s team, and he still put me at shortstop! He must have known that you could play, despite his hang-ups. That’s true with lots of girls who play baseball and are told they have to quit. The question isn’t their ability. It’s a matter of coaches’ opinions. Did you tell your parents or other adults? Were you the type of kid to read a lot of books on baseball and baseball players? I remember reading about players like Nolan Ryan. I read a lot about baseball. Growing up, one of my favorite places was a library. Were there players you looked up to? I liked [pitcher] Orel Hershiser. I liked that he was known as a good person, that he was a thinker and that he was effective. I never talked to him, but he replied to my tweet about a year ago. I said that I’d wanted to be Orel Hershiser growing up, and that it was good that girls could now be Team USA members, that they had other role models who look like them. He agreed with that. What is it that you’ve enjoyed about coaching male baseball players from the college ranks through the major leagues? I enjoy coaching baseball. I coach men because there aren’t women to coach. There are more opportunities, and that’s why I’m coaching men. If there were women’s college baseball, I’d go coach the women. You’ve done both: coaching girls and coaching men. Coaching girls and coaching men aren’t the same thing. At the highest level, you have to coach men. If I’m choosing between boys and girls, I’m going to choose girls. They need someone to believe in them. There wasn’t girls’ baseball, per se’, in the U.S. until I started an All-Star team and my non-profit to really introduce girls’ baseball on a national level. How many girls do you figure are playing organized baseball these days in America? Over 100,000 girls are playing baseball, ages 18 and under. There are only 1,000 girls playing high school baseball. Do girls tell you that they encounter some of the frustrations you did, or have things changed? It’s all of the above. I advocate for girls because they still have many challenges getting to play this game. But it is getting better. They now have Baseball for All – someone who is advocating for them. I could’ve sued at so many different levels in my own career, but I had no idea; there was no one saying: “This is right or this is wrong.” There’s a lot more support for these girls, and they now get to meet other girls who play baseball. Things are growing, but they’re not there yet. Your grandfather [Alvin, now 92] was so involved in the Jewish community in Cleveland. Is that a part of your life, too, like involvement in local institutions or a Jewish Little League? My daughter went to a Jewish day school up through seventh grade. I taught P.E. [physical education] at a Jewish school to grade 3. She’s been more active than I have. I’ve recently become more active, and like to speak to Jewish groups. I’m not as active as my grandfather. I’m currently working with a Jewish speakers’ bureau, The Great Rabbino, based in Minnesota. What would you like to see in professional baseball and even the MLB insofar as women’s presence? I’d like to see women’s professional baseball. I’d like to see more qualified women be given the opportunity to be in more leadership positions. Obviously, we need a general manager. There are so many roles – any of them can be for women. What is your role in prompting some of that change? I’d like to keep coaching. There’s very little in my control. When you’re doing what’s never been done before, there’s very little in your control. Things are definitely improving, because here I am. For example, I was the first woman to pitch batting practice for a major league team. I’d asked [manager] Joe Maddon and the Rays. At first, it was very difficult to get someone to let me, but then Maddon met Chelsea Baker – one of my players, who throws a knuckleball. I threw, and he met her a couple of years later at an awards ceremony. He asked if she wanted to throw batting practice – just like that, with no effort whatsoever. That was a result of him already seeing me throw, seeing that it could be done, seeing the reception from the team. That’s progress. It was no longer the unthinkable. It was doable.